IOAGPL has undertaken road-digging work in all five municipalities. 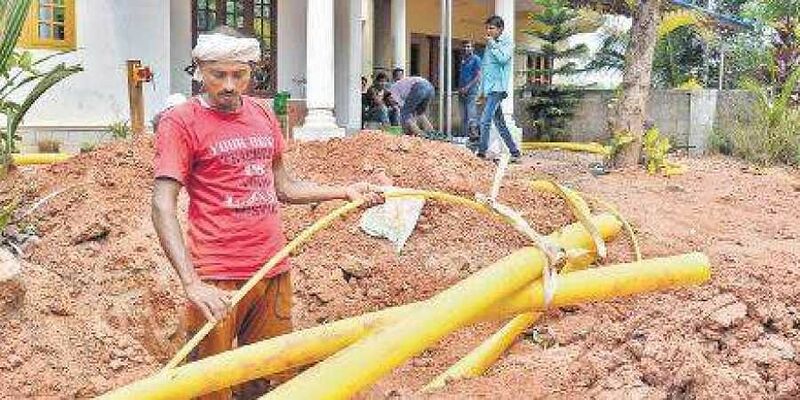 KOCHI: The city piped gas project, which had been delayed for some time, has picked up the pace with Indian Oil-Adani Gas Pvt Ltd (IOAGPL) extending the project to other Municipalities, including Eloor, Thrikkakara, Tripunithura and Maradu. The project, kickstarted in Kalamassery Municipality, was stalled over the issue of road-digging with the civic body.According to a source with the IOAGPL, registration forms had been distributed in over 60,000 households, including those in Kochi Corporation. “Over 20,000 households had responded seeking piped gas. Our plan is to provide PNG to at least 8,500 households in the next six months,” he said. IOAGPL has undertaken road-digging work in all five municipalities. “Our men have started the laying the pipeline. We have reached a consensus with the authorities of all these civic bodies. What happened with Kalamassery Municipality won’t happen here,” sources added. The tussle over road-digging work continues in Kalamassery, where the project was initiated almost 20 months ago. “The work was undertaken in over six wards in Kalamassery. We could give connections to over 1,200 homes. We are yet to reach a consensus over re-tarring the roads. Their demand is we pay the entire amount and bank guarantee before digging. This isn’t acceptable,” said an IOAGPL source. However, Jessy Peter, chairperson, Kalammassery Municipality, says IOAGPL hasn’t yet finished the work in the wards they were given. “Let them first finish the work here. Only then can we allow more wards. The civic body is not against the piped natural gas project. They failed to implement proper repairs on the roads they dug up,” she said. There are issues with the Kochi Corporation too. Though the IOAGPL plans to cover 18 wards in the first phase, they are yet to get the nod from the Corporation. “We approached them many times. It is yet to pass through the council,” said an IOAGPL official. According to Mayor Soumini Jain, the civic body has taken a decision. “We are waiting for the council’s nod. We plan to give permission for 4.5-km for the CNG station in the first phase,” she said. Indian Oil-Adani Gas Pvt Ltd is conducting extensive awareness programmes all over the district on its Piped Natural Gas (PNG) project. Targeting college and school students, IOAGPL is conducting classes and quiz programmes. “This project is still in a nascent stage. We need to create awareness among people as many are still apprehensive about the safety of piped gas. We thought it would be best to educate the young generation first. We have also roped in Kudumbashree workers for creating awareness to households while distributing the forms,” said IOAGPL sources. According to IOAGPL, there are three schemes for availing gas connections. As per the first one, Rs 5,618 has to be paid initially to set up a connection and for the equipment. For those who can’t afford that, another scheme is available wherein Rs 500 can be paid initially and Rs 200 every month as an instalment. The last scheme enables getting the connection at Rs 25 rent every month. The monthly payment can be given as per the meter reading.